Published on 1 October, 2008 in Tech. 0 Comments Tags: dell, hacking, hardware, Linux, mythtv. My good mate Tthu wanted to make himself a mythtv box. 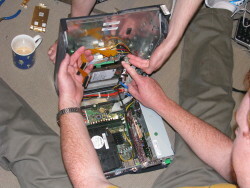 He bought an old Dell online and after a trip to the computer fair to get a 500GB SATA hard drive, low profile PCIe video card and a PCI digital TV tuner card, had everything he needed. 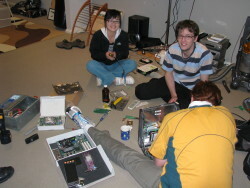 So, at my place we started the install. First thing I noticed was that the video cad had a passive heatsink that took up the space for the only PCI slot in the machine. I gave Tthu the option of waiting and trying to find a more suitable card, or hacking up the box to make it fit. Here began the first of our modifications..
End result? Machine works perfectly with the video card running at about 80 degrees, which is well within spec. How long it all lasts for remains to be seen! Only problem now is that the TV aerial can’t get any signal in the basement.. Jason, where’s that multi-tool?